Well knitting weather is certainly here and you have been visiting the shop to restock – or add to – your stash (you know which category you fit into!!). It is lovely say “hello again” or “welcome back” and help you plan your next project. New patterns and books are arriving in the shop as we gear up to make sure we have all the necessary supplies to see you through the cooler and colder months to come. So grab your yarn and needles/hooks and a ‘beverage of choice’ and find out what we have for you in April. Our regular Friday Sit & Yarn has become sooooo popular and some wonderful friendships have been made. You can see the April dates in the table below. Don’t forget this free group is open to all – however, we have decided to cap the number of attendees each week to ten. Our table just can’t accommodate any more people comfortably and still leave room for staff and customers to move around the shop. Since we don’t want to lock you into a regular commitment we aren’t taking names for each Friday – just rock up and grab a chair till all ten are full. We have some flyers from our local Booroondara Council detailing knitting groups that are held in the Libraries in our area. Feel free to ask us for one – you may find a group that suits your availability to a tee! Additionally, check out your own local council – most areas have knitting groups already established. Term 2 classes swing into action in April. We have some fabulous new classes for you as well as some oldies but goodies! We are eager to help you expand your knitting and crochet skills and have a good selection of techniques for you to try. Just give us a call at the shop (9830 1609, Mon – Sat 10am-5pm) and we can answer any queries you may have as to class content and your suitability for each one. In the past, our classes have been run on Wednesday nights. Term 2 sees them moved to Tuesday nights. We hope this doesn’t cause too much inconvenience and that it allows additional customers access to educational opportunities. The shop will be CLOSED on Monday 25th April for Anzac Day. We will OPEN again on Tuesday 26th April at 10am. As you know from a previous blog post, we now have a Product of the Month each and every month! The highlighted product for April is the very lovely Milla Mia 5ply. This beautiful yarn is a 5ply (Sport), 100% merino wool yarn. It is so very soft – perfect for cowls, scarves, shawls, baby garments and all those ‘wear next to your skin’ projects. An upcoming blog post will tell you more and we have some items made up in the shop for you to see this lovely yarn ‘in action’. Sadly, Milla Mia will no longer be available to us wholesale (you will be only able to get it through an international online shop) so what we have left is all we can get! If you love this yarn, and we know many of you do, now is your opportunity to grab some at a reduced price. A yarn that just cannot be ignored!! Annnnnd ……. WE HAVE MORE NEW YARNS!!!! We will just give you the short version here because we will feature some of them in upcoming blog posts. White Gum Wool – a gorgeously soft Australian yarn – we have the entire range of 4ply colours. We knitted one ball into a sample for you to feel and it just went on forever!! Orkney Angora – it has to be felt to be believed – an 8ply yarn, 80% angora/20% wool (angora from ethically and humanely treated rabbits) in many colours from the Orkney Islands. Mmmmm…..
You will notice some new faces behind the counter over the coming weeks. Karyn (not to be confused with Karen – lol, we still haven’t been able to figure out an appropriate way to stop them both answering ‘yes’ at the same time!!!) has been one of our extraordinary sample knitters for quite a while – you will notice her work all around the shop. She has great technical ability and isn’t afraid to tweak a pattern! Adele is particularly adept at colour work and is also joining the teaching crew – she will be introducing Kids Holiday Knitting Classes for us during this term. You can find out more about them on the Classes page on the website. Bex has been a customer for quite some time and always has a project or two on her needles. As always, our YouTube channel, Sunspun, has new videos to ‘teach’ you – this month is ‘garter stitch’ month. Learn how to graft (Kitchener Stitch) in garter stitch and how to use a double ended crochet hook (available in the shop) to easily and quickly pick up those dropped garter stitches. In our Ravelry group, Sunspun Fibre Folk, we are starting a couple of new monthly discussion threads for you to participate in. The first is centred around garments – each month we will feature a new garment and ask you to share past or current projects. The second will be more general and talk about yarns, colours, shapes, etc. Lots for everyone! And don’t forget to share your show and tell by using the ‘Share with Group’ box on the project page for each of your projects. You will notice lots of folk have already been sharing with us. Click on the pics and see some really lovely items. Wow! Did your ‘beverage of choice’ last through all that? 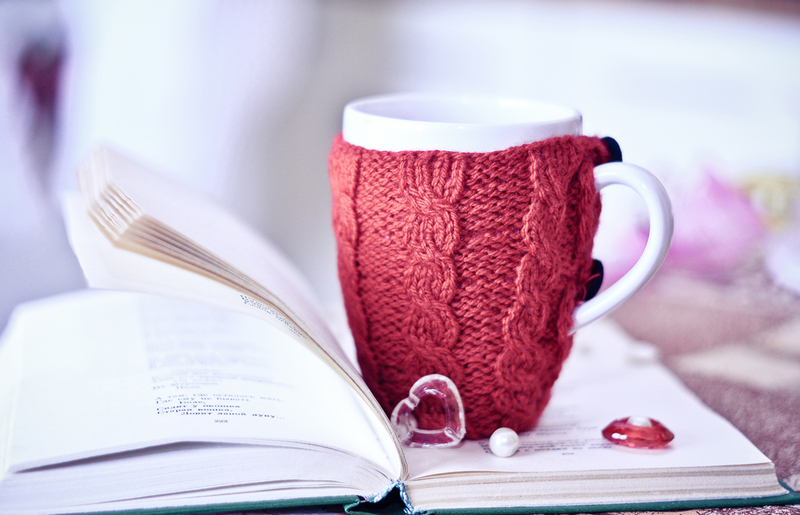 No – then grab another and start knitting/crocheting those ‘yarny’ projects that warm us both inside and out. Categories: Classes, events, Knitting, New, Product of the Month, sit and yarn, Sunspun news, Yarns | Tags: Australian yarns, crochet, crochet classes Melbourne, knitting, knitting classes Melbourne, knitting events, knitting Melbourne, Melbourne yarn shop, Sunspun, Sunspun classes | Permalink. We know a lot of you have been keenly waiting for it, so we’re very pleased to release our class list for Term 2. We have some exciting new classes for you (look for the * in the schedule) and, of course, we will be re-scheduling all those you already know and love! We have changed the day of the week the classes will run on – classes will now occur on Tuesday nights from 6.15pm – 9.15pm. This term sees the introduction of our new Fit Your Knit series – a series of classes designed to help you learn about your body shape, create patterns specifically to your measurements, customise commercial patterns from other designers for fit and to re-gauge patterns for different yarn weights. Watch out for them over the coming terms. Also new to this term – Kids Holiday classes. Run on Thursdays in the school holidays (June/July), kids (aged 7+ years old) can learn to knit or increase their knitting skills. These classes will be 2 hours long and are scheduled for 11am – 1pm. Are there budding knitters in your household?!?! The Term 2 schedule is shown below and a full description of each class can be found on our website here. We would like to introduce you to a new ‘in-house’ teacher – Adele. You will see her behind the counter as well so be sure to say hello. Adele will be teaching our Kids classes. You can read more about her (and our other teachers) here. If you have any questions or queries please email us (shop@sunspun.com.au) or give us a call (03 9830 1609). Categories: Classes, Knitting, Sunspun news | Tags: crochet, crochet classes Melbourne, knitting, knitting classes Melbourne, knitting Melbourne, Sunspun | Permalink. It’s Autumn!! You know what that means – cooler weather is coming. 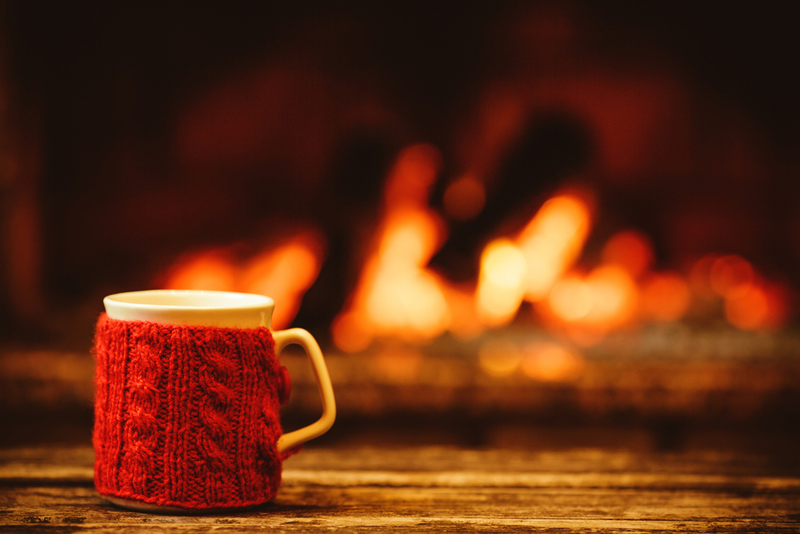 The days are getting shorter, we are spending more time inside with our knitting and crochet warming our laps and keeping our hands extra busy and our spirits are soothed by the yarn running through our fingers. March is another busy month for us – lol, they all seem busy! We have our regular Friday Sit & Yarn – it is becoming sooooo popular and some wonderful friendships are being made. It is quite on the cards that we may even have our first baby born this month (the due date is early April but you know babies – their schedule is all their own!). Don’t forget this group is open to all. You can see the dates in the table below. Wednesday nights sees more classes happening – including a class taught by our special guest teacher, Australian Designer extraordinaire, Kirsten Johnstone. Kirsten proudly flies the banner for Aussie designers internationally and has designed for some of the most popular yarn companies and magazines around today. We are absolutely thrilled to be able to have her garments in the shop for a Trunk Show. As well as teaching for us, Kirsten will participate in an (invitation only) Meet, Greet & Nibbles night for Sunspun Members and will also be in the shop to meet you all, answer questions and watch you try on her lovely garments! All the details can be found on our blog. This year Easter has come early. We will have a display in the shop of some ‘Easter’ inspiration for you. The shop will be CLOSED from Good Friday through to Easter Monday and will OPEN again on Tuesday 29th March. We will remind you closer to the date. As you know from a previous blog post, we now have a Product of the Month each and every month! The highlighted product for March is the exquisitely soft Baby Alpaca by Shibui Yarns. This beautiful yarn is an 8ply (DK), 100% baby alpaca yarn. It is so very soft – perfect for cowls, scarves and shawls. An upcoming blog post will tell you more and we have some items made up in the shop for you to see, touch and try on. A yarn that just cannot be ignored!! Annnnnd ……. WE HAVE NEW YARNS!!!! We will just give you the short version here because we will feature some of them in upcoming blog posts. Woolfolk yarns – ALL of them! As always, our YouTube channel, Sunspun, has new videos to ‘teach’ you and our Ravelry group, Sunspun Fibre Folk, has new discussion threads for you to participate in. Phew! Did you need a cuppa to get through all that?!?!? Well, save your energy for March because Sunspun will be ‘hopping’ (pun intended!!). 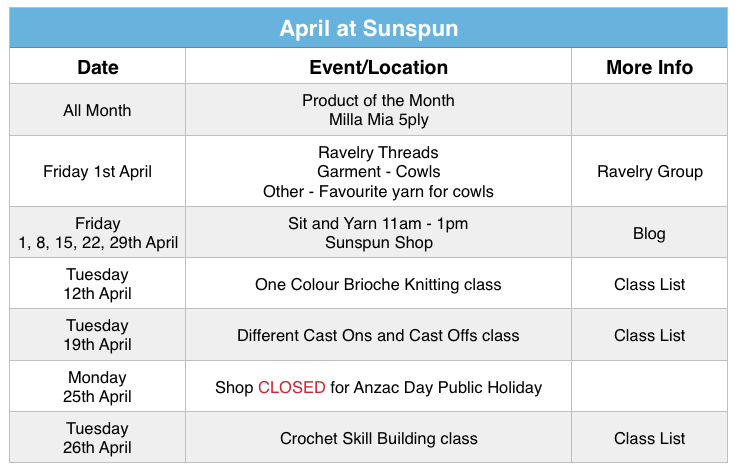 Categories: Classes, events, exhibitions, Knitting, New, Product of the Month, sit and yarn, Sunspun news, Trunk Show | Tags: crochet classes Melbourne, knitting, knitting events, knitting Melbourne, Shibui, sit and yarn, Sunspun, Sunspun classes, Trunk Show, woolfolk, zealana | Permalink. Well, the heat is still with us – perfect for cool summer knitting projects! The kidlets are back at school and the ‘real’ year is beginning. We will be kicking things up a few notches this year and introducing some new activities and opportunities for you to have some fun with your yarny endeavours and to increase your knowledge of all things yarn. To start us off, our Term 1 classes get underway. We have some new classes, some returning classes and some new and guest teachers for you – oh, and of course, our beloved ‘returning’ teachers!! You can check out our Classes page to find out more. We have added a Classes Board in the shop displaying some samples of what each class offers to help you decide what class/es is/are best for you. One of the exciting new ‘activities’ we are starting this year is our Product of the Month. Each month we will feature a different product – it could be a yarn, a book, a pattern or a tool – and we are offering a 10% discount (20% for Members) on the chosen item for the entire month! Woohoo! We will have a display set up in the shop so look for it when you come in. All the nitty gritty in an upcoming blog post. February is the month of ‘amour’ – well at least Sunday 14th is! Along with our Product of the Month display we will have a Valentine’s Day in shop display up and running from 1st – 13th February. We have some patterns, samples and products all suitable for you to show your love and appreciation to significant others in your life. 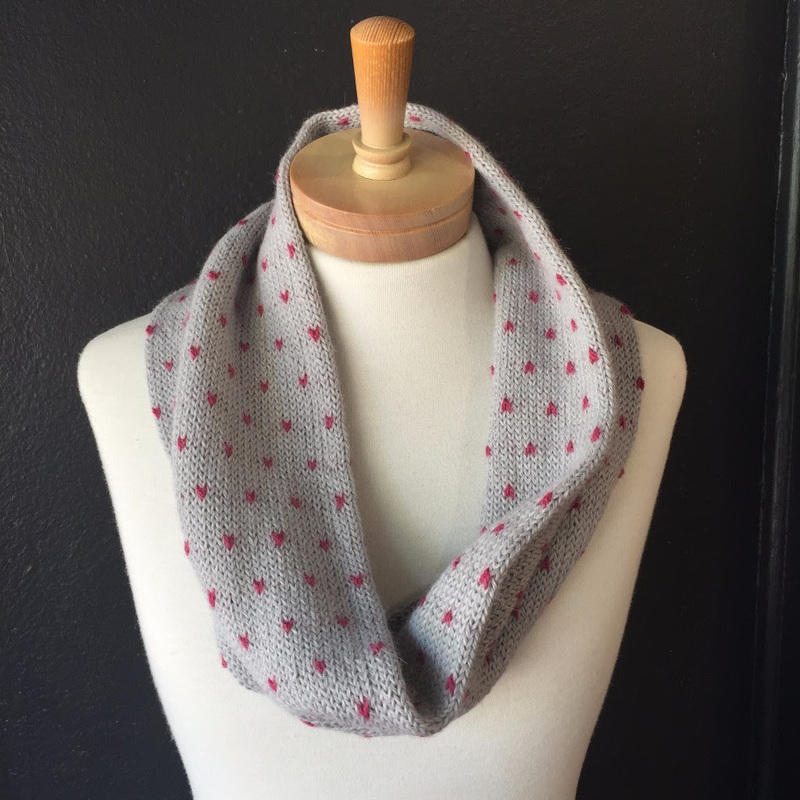 Shown above is one of our new samples for our Valentine’s Day display, Lovely Cowl by Ashley Solley knit in Shibui’s gorgeously soft Baby Alpaca. We will be adding new content to our Youtube channel this month so keep an eye open for it. And our Ravelry Group – Sunspun Fibre Folk – is growing steadily. 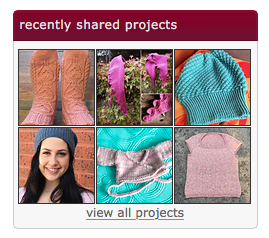 There is a new thread open for chatting – First Project on Your Needles/Hook in 2016. Click on over and share, show and tell us all your first project for 2016. 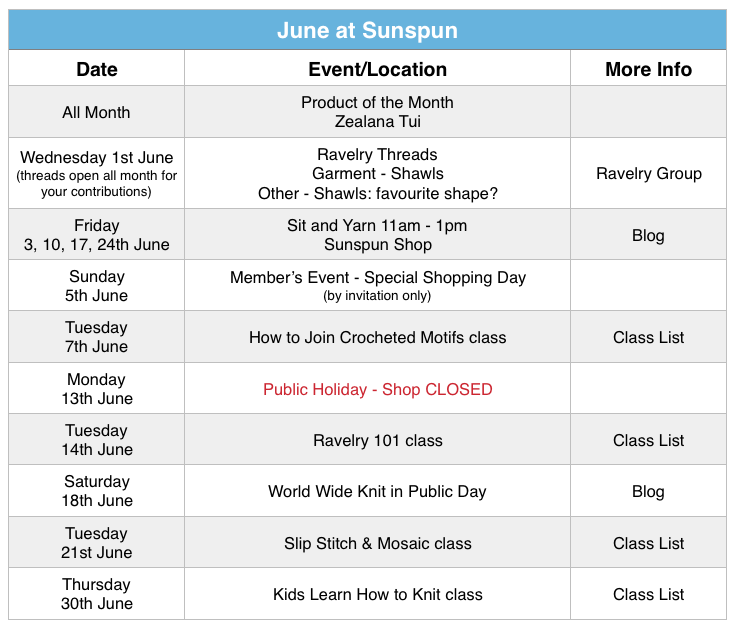 Categories: Classes, Crochet, events, Knitting, New, Sunspun news, Uncategorized | Tags: crochet classes Melbourne, knitting, knitting classes Melbourne, knitting events, Product of the Month, Sunspun classes, valentine's day | Permalink. As someone who both knits and crochets, it’s been a little surprising to learn recently of the so-called ‘divide’ between those who knit and those who crochet. Who knew? When this grows up, it’ll be a rainbow blanket. Pattern based on the Ridge & Furrow Scarf. The two cultures question came up because my four-year-old niece asked me to make her a rainbow blanket. Easy, I thought, granny squares, here I come: it’s modular, I can tuck a square in here and there, and after a few hundred of them, we’ll be done. Then I started planning, and realised that I may just have to … knit this blanket. Which led me to wonder, what considerations do people take into account when choosing to knit or crochet something? 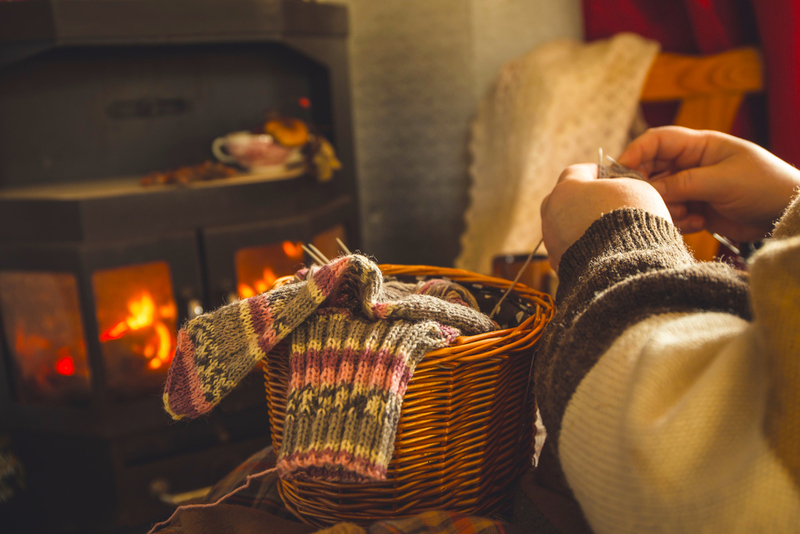 Knitting can feel unwieldy until you get the hang of it, and therefore frustrating – who hasn’t encountered twisted and dropped stitches, wrong stitch counts, slippery yarn that won’t stay on, and so on. Plus, beyond knitting needles of the right size, you often need needles of the right length as well for the job at hand. My decision to knit came about primarily because I wanted to use stash yarn, and there wasn’t enough of every rainbow-ish colour in 8 ply. I did have all the colours that made up the rainbow, but of different tones and hues. The other consideration was weight: the granny-square blankets we have are quite heavy, compared to the knitted ones, and the fabric much sturdier. I wanted something softer that draped. What I knit and crochet fall into very clear categories. I crochet in summer when it’s too hot to have a growing pile of something on my lap, and when I feel a need for instant gratification, so it’s mainly toys and homewares – not surprising, since sturdiness is a necessary and desired quality for all those items. And I always crochet for school-fete goods such as little bowls, brooches, jewellery, mandalas, small colourful items and Christmas snowflakes. finished with an oversized mother-of-pearl button. The round mandalas are by Lucy at Attic24, and the scallop-edged ones are Barbara Smith’s Little Spring Mandala. At the end of the day, both are complementary skills that are portable, easy to execute and don’t require impossible machines. If you know one and want to learn the other, we run classes in both. Discover for yourself! And take inspiration from Japanese designer Setsuko Torii, whose work often combines both cultures to quite dramatic effect, as in this Patchwork Skirt. In store news, we have 22 shades of the Debbie Bliss Blue Faced Leicester instore. This lovely DK-weight yarn from a heritage breed produces soft wool with lovely drape and lustre, and the stitch definition is excellent. Each 50 g ball yields 108 metres, and is $11 per ball. Brooklyn Tweed’s Wool People 9 is just out too, and features some beautiful lacework and architectural pieces, perfect to chase away winter evenings with while you dream of spring. Categories: blankets, Crochet, Knitting, Yarns | Tags: Brooklyn Tweed, crochet classes Melbourne, Debbie Bliss, Debbie Bliss Blue Face Leicester, knitting | Permalink.